Herondale, originally uploaded by jahansell. 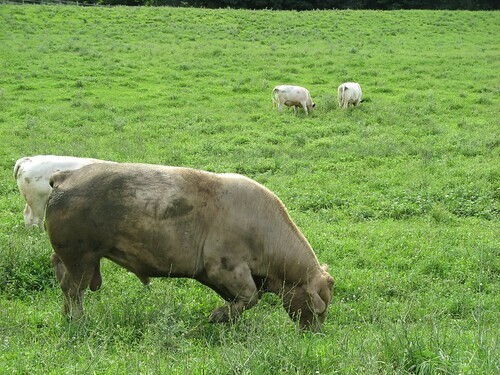 Need a supply of grassfed, organic beef, pork and free-range chicken? Herondale Farm in Ancramdale is your source! I visited there a few days ago and got a tour of the operation - from the fuzzy baby chicks under warming lights, to the older chicks in protective pens, to the adults scrabbling around in the grass to, yes, the slaughtering room! I am sorry this blog has been inconsistent lately. The supply chain for a daily photoblog is long and can break down anywhere along the line: one goes out and takes pictures, uploads them to the computer, looks through them to choose and photo-edit the best (trying to avoid children, pets and flowers, which make up a large portion of my daily photographic output! ), loads those to Flickr, and then blogs the best one for the day. This past week was a tough one, but perhaps next week will be better! Sounds like these would be good to eat since they are organic! I enjoy seeing the various pets and flowers from around the world. There are many plants that don't grow here or that I have never seen. I am with boise diva...post the kids and the pets...bet they would be fabulous.....but I understand the delima....some times it is easier to blog than others isn't it? Post away. I have no idea from on day to the next what I'll be posting, apart from skywatch. Much easier that way. That looks one happy cow.